Last weekend we had a few visitors! My brother Rob came in for the weekend and we had an unexpected visit from my husband’s college roommate Todd on Saturday. While we were overjoyed to see Rob and Todd I quickly realized that my husband Raf didn’t have any beer to offer them! Seeing some fruit leftover in the fruit bowl reminded me of our recent trip to Spain where we tasted the most delicious sangrias in every city/region we visited (Madrid, Barcelona, Seville & Toledo). Every restaurant that we visited in each city had their own version of sangria. Each was unique and tasty! After a quick perusal of our bar, I decided to surprise them with Springtime Sangrias! We were sitting around the kitchen island chatting and laughing while the Sangria was easily prepared. 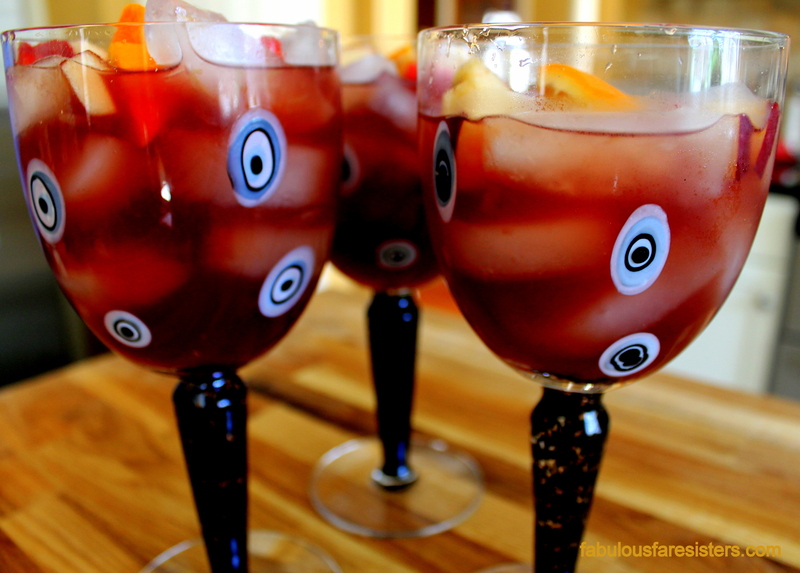 It was a delicious ruby red brandy-inspired sangria that everyone loved…hope you enjoy it too! Prepare the simple syrup: Place half a cup of water and half a cup of sugar in a small saucepan. Heat, stirring, until sugar has dissolved but do not bring to a boil. Remove from heat when sugar has dissolved and set aside to cool. Slice the fruit: With the naval orange, lime and the lemon, cut half into small chunks and the other half save to be used to squeeze the juices into the finished sangria; cut the apple into small chunks; slice the strawberries. In a large bowl or pitcher, pour the red wine, the brandy, the orange juice, and the juices of the orange, lemon & lime. Stir in the cooled simple syrup. Add the chopped fruit and stir. One thing we learned in Spain is that the sangria can be served immediately by just pouring over a glass of ice! However, the flavors intensify as the sangria sits in the refrigerator until you’re ready to drink it! The choice is up to you. [brother] Rob here……..the sangria was great! An unexpected but welcomed aperitif for the evening’s plans……. I agree! And now you and Maria can make it this summer! !